The Velocity Trap is the Bermuda Triangle of space! 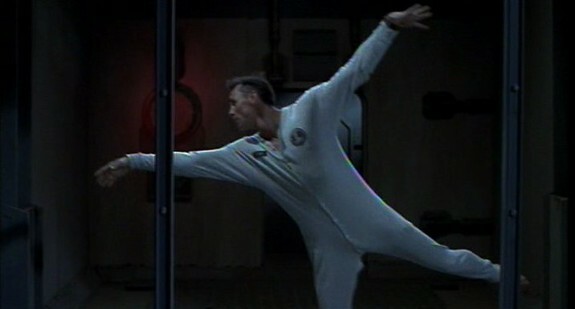 Olivier Gruner is the Jean-Claude Van Damme of France! 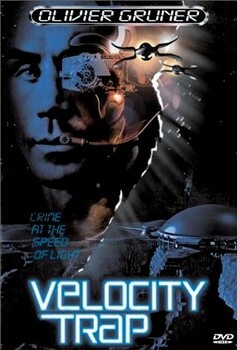 With 40 gadzillion dollars in cold hard futuristic space cash on board a transport ship and a gang of space pirates bent on the biggest heist in the history of our galaxy, there can be only one outcome: crime at the speed of light! A few hundred years in the future, man has spread to the stars and as in the case of most futures that involve something other than desert wastelands with mutant bikers harassing fertile women, there’s nothing much happening other than mining operations on various worlds. Gruner plays a cop named Stokes who works on one of these worlds and who’s been set up to take the fall for murdering a fellow cop. There’s some type of backstory about Stokes and his old lady having a kid who died and somehow his old lady is now under contract to the evil manager of the mines. That’s really too bad for Stokes and all, but I was mentally urging them on so we could get to the part where Stokes gets assigned to the crappiest job in the known universe: security detail on a ship going into the Velocity Trap! I was concerned that with this murder charge hanging over his head that Stokes would spend his time on some boring prison planet where he’d be forced to fight in some illegal kickboxing tournament set up by the sadistic warden those types of facilities inevitably have. Improbably though, the manager of the mines explains that if Stokes was put on trial, it would embarrass the department and if he just killed Stokes his old lady would cause trouble, so he’s just going to assign Stokes to this six month job babysitting a spaceship full of cash. Huh? So who set him up and what was the point? If the evil mine manager was behind the frame up and had the authority to get him out of the murder charge, why not just assign him to this detail from the beginning? Without the pointless conspiracy? If it was someone other than the mine manager, it makes even less sense from a story standpoint to include all that since nothing more is said about the incident. Sure, you have to get Stokes on board the ship to have the movie, but there’s less tortuous ways to do it. I mean, people have been forced into duty on ships for centuries without all this rigmarole. Heck, Britain was such a professional at this that it actually had an official organization (the Impress Service) to do it! In addition to Stokes, the crew of the ship with all the cash totals three. There’s the tough female navigator, the captain (Bruce Weitz who showed up in the Jeff Speakman killer satellite movie Memorial Day the next year) and another crew member named Cruz. I would complain about the fact that the only security a ship full of cash had was one cop who was only there because he was being punished, but this is a future where giant starships are run with as many employees as some modern day convenience stores. The first three months of the trip are uneventful with Stokes engaging in a montage of time killing escapes like doing exercises, ballet, and spitball target practice. Then the alarms signalling a collision go off! The collision turns out to be the space pirates docking with the ship and Stokes is just able to wake up the navigator to assist him in fighting off the theives. 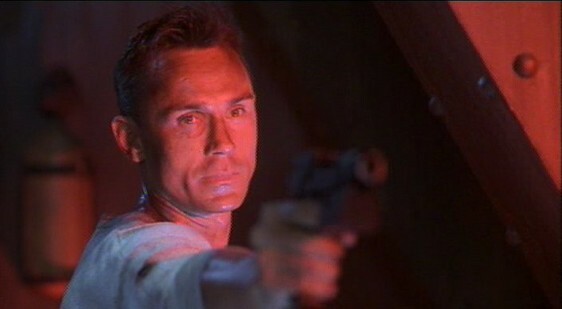 The remainder of the film is a collection of scenes where Stokes is running through parts of the ship and fighting the thieves with space blasters. For no reason at all, Stokes even ends up falling down a tube right into the part of his ship that houses a killer robot! That would have been handy against the criminals if it wasn’t just stored in the basement! Despite the fact that it’s just Stokes and the navigator against the looters, there are only about four of them, so it isn’t like he’s up against insurmountable odds. In fact, there’s so few criminals that near the end of things Stokes has to work with them to avoid being smashed up by an oncoming asteroid! I guess they knew what they were doing when they only assigned one guy to guard the ship. These crooks are also the sort of dumb crooks who even though they manage to lock down the controls of Stokes’ ship so he and the navigator can’t change course, they somehow still allow Stokes access to an escape shuttle. Thus we are treated to the big dogfight in space before the bad guys let them land on their own ship. The navigator quickly plugs this potential plot hole by guessing that the criminals don’t have enough guys left on their own ship to prevent this. How many guys does it take to punch the “undock” button? Gruner is a relatively inoffensvie presence though he always looks like he’s about ready to burst into tears and the sets and special effects aren’t as hideous as you would expect from a movie starring the Jean-Claude Van Damme of France. The ending is conveyed to us via a news report (which saves the time and money of actually shooting the scenes of what happened) and is as unconvincing as the rest of the story. I won’t spoil it, but how was Stokes going to explain what happened if someone who recognized him ever saw him again? And the fact that no one seemed to connect his apparent disappearance with two other events described in the newscast would strain my suspension of disbelief if I wasn’t so enamored with slow motion scenes of Stokes flying through the air due to various explosions and depressurizations. Ridiculous plot, decent action, and solid production values. Just the sort of thing you’re looking for amidst the rest of the space trash out there.